Aw, Hello Kitty. How we adore you. 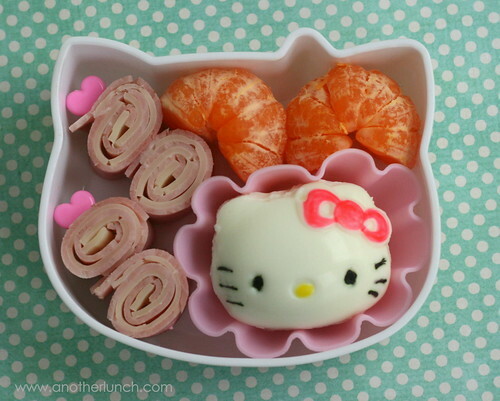 In this little Hello Kitty bento box there is a hard boiled egg, clementine, and a couple ham and swiss roll-ups on heart picks. 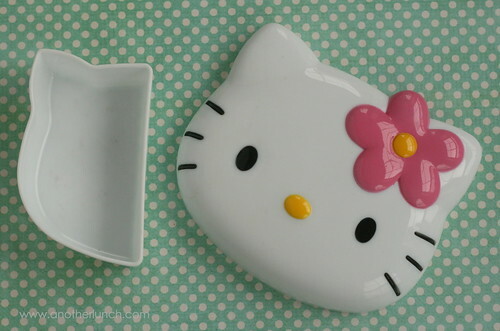 The hard boiled egg is shaped like Hello Kitty by using a hard boiled egg mold. It was the first time I'd used this one and one of the latches came off as soon as I opened it! Luckily, it still worked just fine. I highlighted the face details of the Hello Kitty egg with food safe markers. Are you new to shaped eggs? I remember the first time I saw one in a bento box it blew my mind. I was astonished such a thing was possible. LOL! If you'd like to know more about how it's done you can check out my tutorial: how to make shaped eggs. I love egg molders. I was amazed the first time I saw them too. I like that it takes something healthy and makes it irresistible to my kids. They are also usually super super cheap, the last ones I bought were 2 for 25 cents on amazon.com plus shipping. Just stumbled on your blog this weekend and LOVE it. Lunch at your house looks like loads of fun. You are so creative. Thanks for sharing your talents with us. I love the Hello Kitty egg mold. I can add it to my collection now that I have a little girl. Love the lunchbox, but when I went to check it out on Amazon the shipping is almost as much as the lunchbox. Sadness ... another other suggestions about where to get cute lunchboxes? If you follow the other link that's in the post it goes to all their Hello Kitty gear on site. Prices are great, shipping is reasonable (especially on larger orders), the only downside to JBox/Jlist, in my opinion, is that the stuff ships from Japan, so shipping takes a few weeks. But I've personally ordered from them many times and have been really happy with the service. Cute! 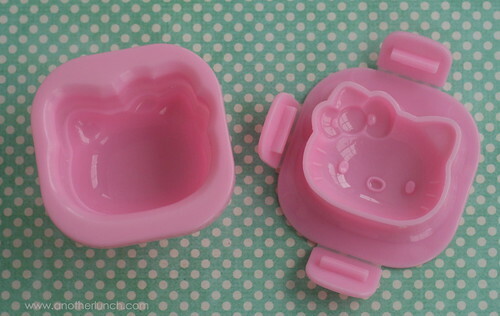 I have this Hello Kitty egg mold too, and yeah, I find it flimsy compared to my other egg molds. I don't have food markers either so it's hard to tell it's Hello Kitty!